The Mc Intosh stereo C47 preamplifier exhibits unprecedented versatility in terms of connections and operation. With 12 inputs in total, you can connect most, if not all audio sources under the sun! The digital inputs comprise 2 optical inputs, 1 coaxial input and 1 USB input. 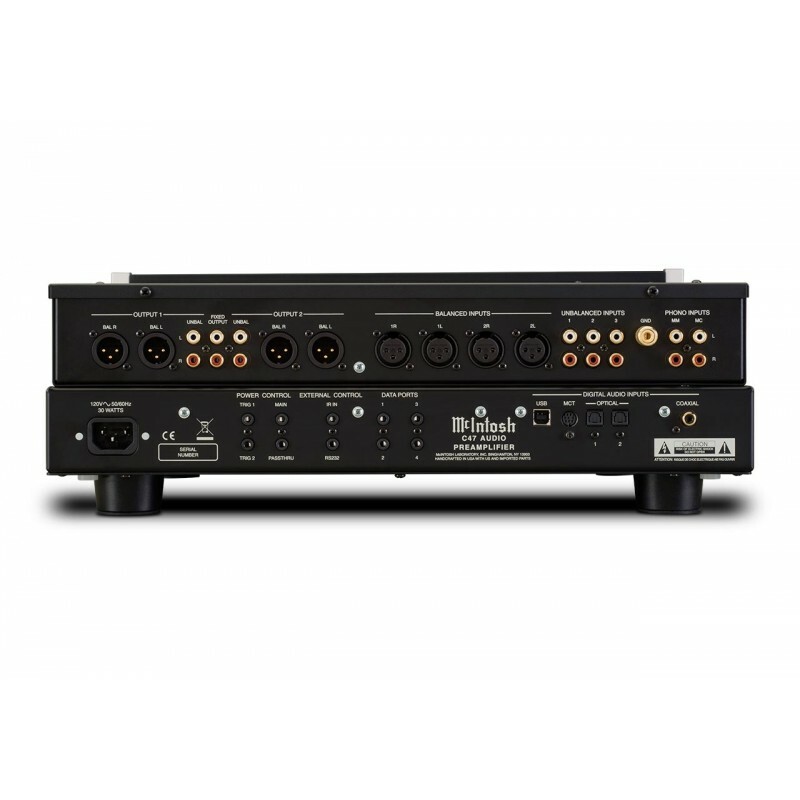 The optical and coaxial inputs decode music up to 24 bits/192kHz for high resolution playback. 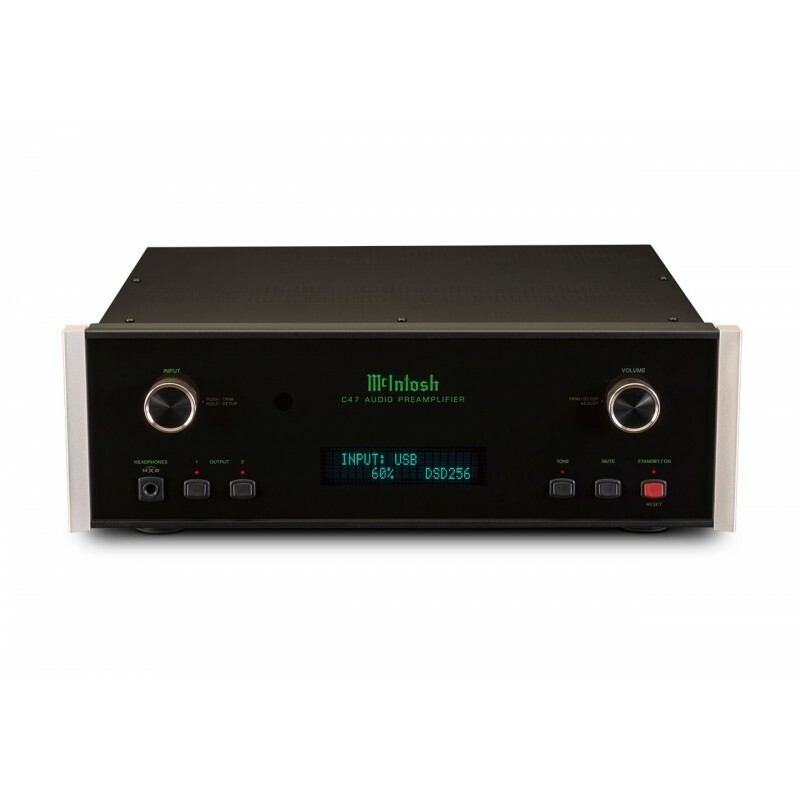 The Mc Intosh C47 can also process and read high fidelity DSD files via the USB input, which accepts signals up to 32 bits/384 kHz and DSD64, DSD128 and DSD256 with DXD 352, 8 kHz and DXD 384 kHz. To get the high-definition audio quality delivered by SACDs, you can also connect the C47 preamplifier with the MCT450 SACD/CD drive via the MCT input to create an optimised DSD connection. In regards to analogue sources, it has 2 XLR inputs, 3 RCA inputs and two fully configurable MM and MC phono inputs. The outputs were doubled for good bi-amplification. The bass and treble pitch controls allow for precise adjustment if necessary. The headphone output is meticulously designed! It is fitted with the 'Crossfeed Director' system (HXD ®). It adds an extra dimension to playback with headphones. Also note that the 'Home Theater Pass Through' allows for a completely seamless integration to a multi-channel or home-cinema system. The Mc Intosh C47 preamp features a great glass front panel with the manufacturer's signature green illuminated logo. This preamplifier exhibits an uncompromising design... We recommend pairing it with good quality elements. Playback is amazing! The top of the spectrum shows no signs of harshness. The mids are textured and detailed, never bringing forward any harshness. It is transparent, very clear and detailed across the entire spectrum. The bass is very clean and precise! It has outstanding articulation. With high-resolution DSD files, it is the very best in terms of musicality and realism. The MC phono input is excellent! It allows for this C47 to be paired with a high-performance vinyl turntable and phono cartridge! The Mc Intosh C47 preamplifier features all the technology and musicality that have made Mc Intosh successful for over half a century! It is a legendary Hi-Fi product, combining a classic design with cutting-edge technology. It fully meets the demand and requirements of 21st Century audiophiles! A must! Output impedance: 16 V XLR and 8 V RMS max.